Here at Toby, we believe there's only one way to do our beloved Great British roast - and that's properly. Every day, your local Toby Carvery lays on a family-sized feast of tender, slow-cooked meats, eight lots of veg including crispy, ruffled roasties and all the trimmings. So you can enjoy your favourite carvery meal just the way you like it, whenever you like it. You'll find lots more on offer, such as tasty specials, all-you-can-eat breakfasts and even comfy accommodation at some of our restaurants. Every spud is checked by hand and ruffled for extra crunch. All of our meat is slow-cooked and basted to succulent perfection. And our Yorkshires are freshly made in our kitchens and served crisp, fluffy and piping-hot to your plate. That's what makes us the home of the roast. 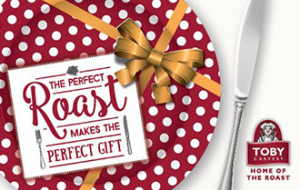 Visit the Mitchells & Butlers website and use their postcode search tool to check the locations at which your gift card can be used here. To use this gift card, just show the code to your server, who will redeem it for you. The gift card is valid if you show it on your smart phone or print it out. This card may not be exchanged for cash. This card is not a cheque guarantee, credit, debit or charge card. No change will be given but the balance can be used for future purchases. We will not be held liable for lost or stolen cards - protect this as you would cash. To check the balance of your giftcard please visit www.tobycarvery.co.uk/giftcards A giftcard is valid for 12 months from the date of purchase. This card is valid for use at Toby Carvery restaurants only. Gift cards can be purchased with a minimum value of £10, up to a maximum of £250. Text and email gift cards should be treated as cash. If deleted they will not be resent. Email gifts are valid either presented on a smart phone or printed out. We reserve the right to amend the terms and conditions. Further terms and conditions are available upon request.